Football is a national pastime in the United States and tailgaiting, the parking lot party before kickoff, has become something of a phenomenon. 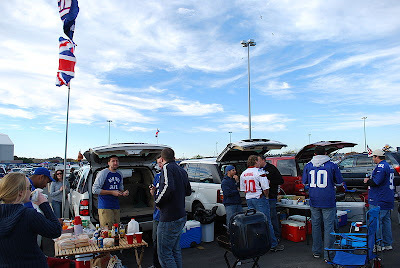 In many cases the tailgate party even eclipses the game for some fans who gather for hours, and sometimes days, before the game in the stadium parking lot to eat, drink and party. The latest trend in tailgating, according to The San Francisco Chronicle, is using RVs and motorhome rentals instead of cars and SUVs. Not only do these vehicles ensure increased comfort, but they also make travelling to out of town games much easier for fans. Today's savvy tailgaters come prepared to put out a feast fit for an offensive line, with a variety of meats sizzling on the grill, chili simmering in a Crock-Pot, and all types of side dishes and munchies spread upon the tables. Not surprisingly, a growing number of these enthusiasts have discovered that the best vehicle to accommodate their mobile parties is a motorhome." Not only do RVs and motorhome rentals allow for easier and comfortable cooking, eating and sleeping, they also solve that niggling problem of the bathroom (much more of an issue for female fans, admittedly). Just think of the improvements over a regular car from electricity to storage and, really, one can't even begin to compare a fridge to a cooler. This trend has gained such momentum that many motorhome associations even have groups dedicated solely to tailgating. If you're looking to grab a beer and grill up a steak at a tailgate near you in your own motorhome rental then head to MotorhomeRoadtrip.com for some great deals and USA motorhome roadtrip ideas.